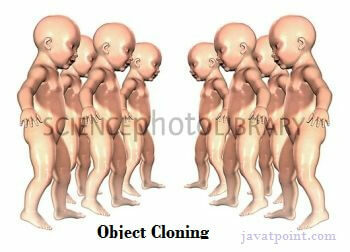 The object cloning is a way to create exact copy of an object. The clone() method of Object class is used to clone an object. The java.lang.Cloneable interface must be implemented by the class whose object clone we want to create. If we don't implement Cloneable interface, clone() method generates CloneNotSupportedException. The clone() method saves the extra processing task for creating the exact copy of an object. If we perform it by using the new keyword, it will take a lot of processing time to be performed that is why we use object cloning. You don't need to write lengthy and repetitive codes. Just use an abstract class with a 4- or 5-line long clone() method. It is the easiest and most efficient way for copying objects, especially if we are applying it to an already developed or an old project. Just define a parent class, implement Cloneable in it, provide the definition of the clone() method and the task will be done. Clone() is the fastest way to copy array. To use the Object.clone() method, we have to change a lot of syntaxes to our code, like implementing a Cloneable interface, defining the clone() method and handling CloneNotSupportedException, and finally, calling Object.clone() etc. We have to implement cloneable interface while it doesn?t have any methods in it. We just have to use it to tell the JVM that we can perform clone() on our object. Object.clone() is protected, so we have to provide our own clone() and indirectly call Object.clone() from it. Object.clone() doesn?t invoke any constructor so we don?t have any control over object construction. If you want to write a clone method in a child class then all of its superclasses should define the clone() method in them or inherit it from another parent class. Otherwise, the super.clone() chain will fail. Object.clone() supports only shallow copying but we will need to override it if we need deep cloning. As you can see in the above example, both reference variables have the same value. Thus, the clone() copies the values of an object to another. So we don't need to write explicit code to copy the value of an object to another.